Nicely situated off Highway 73, home has a full walk-out basement under main floor master and three bedrooms. Walk-out three season porch, overlooking large open back yard. Finished basement with 3 finished rooms plus lg rec area, utility room cedar sauna and bathroom. Newer steel roof. Lg 2 ½ stall garage w/woodworking and shop. Cement floor, Insulated with wood stove. On 40 acres. Questions? Contact Kaija Kokesh, Realty at 218-845- 2260. SPORTING - 2005 POLARIS ATP 500 4X4 WHEELER; Other Polaris Wheeler; Dbl. Snowmobile Trl; Deer Stands and Game Hoist; Mounts- Deer, Fish, Bobcat, Fox, and Birds; Prints; Calls; Hunting Clothes; Ice Auger; Cherrywood Dog Crate; Knives; Fishing Rods; Tackle; Camping Supplies; Etc. 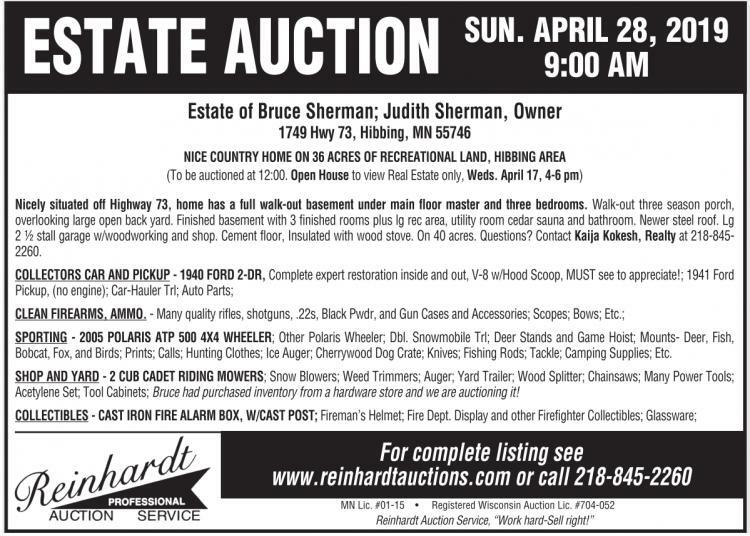 SHOP AND YARD - 2 CUB CADET RIDING MOWERS; Snow Blowers; Weed Trimmers; Auger; Yard Trailer; Wood Splitter; Chainsaws; Many Power Tools; Acetylene Set; Tool Cabinets; Bruce had purchased inventory from a hardware store and we are auctioning it!